Potluck parties are a great way for friends to get together for a party without putting a lot of stress or expense on the one person hosting the event. Yes, the host will need to make their home comfortable and clean enough for guests, but the responsibility for food and beverages are shared. As with any activity that involves a group of people, it's important to take into consideration the other members of the group. Whether you're the host or simply a contributing guest, think about these etiquette rules to help to make it a happy experience for everyone attending. 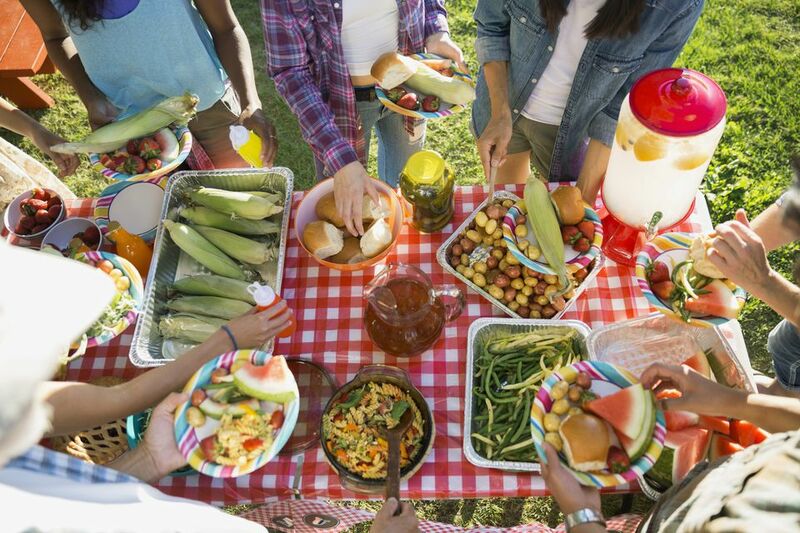 As you begin to organize the potluck, break down the meal into different categories of contributions. These will include appetizers, main dishes, salads, desserts, beverages, and party goods. Often the host will make the main course for the group, but that's not a hard and fast rule. Keep track of what each guest commits to bringing so you can see which categories need additional contributions. When guests ask what to bring, give them a choice of two categories so they can choose something that fits their time and budget. It's also helpful to provide an estimate of how many guests will be attending so your guests can make the right sized portions. Don't tell someone to bring a particularly expensive item. For example, a fruit salad for 20 or steaks to feed a crowd would put a large financial burden on any one individual. On the other hand, if they volunteer without your asking, it's fine to accept. A potluck is not a substitute for a party you should be responsible for hosting on your own. If you are hosting a party, it's your responsibility to entertain and feed your guests, at whatever level you can afford. When deciding what to bring, think about its appeal to the majority of other guests. If you've agreed to bring a main dish, don't show up with a dessert instead. You should always bring what you've committed to since the balance of the meal has been organized by your host. If you've agreed to bring an appetizer, paper plates, or utensils, you, more than other guests, must be on time. A bag of potato chips is not an adequate contribution to a potluck dinner unless your host specifically told you to bring that. A potluck assumes everyone is going to bring a dish into which they've put some time and effort. If you've been invited to a potluck, you shouldn't attend and eat unless you've made a contribution to a meal. For example, offices will sometimes organize potluck lunches as an opportunity for staff to socialize. Don't show up in the conference room and eat unless you've brought something to share. Your food should be ready to serve when you arrive at the party. If it's an item that needs last-minute attention, such as a salad that needs the ingredients tossed together when you arrive, be sure to bring tongs or serving spoons for tossing it. It's also best to bring the food on a platter or a nice looking bowl. Do not expect your host to provide any serving plates or utensils. Unless it's already been approved by the host, don't bring a dish that still needs to be cooked at the party. It's a nice touch to bring a small tent card to place by your dish to indicate what's in your dish. It will help friends with allergies or food aversions to easily identify the ingredients. Some groups decide to plan potlucks where the expense of the meal is divided among all participants. If that's the case, avoid an expensive item that is beyond the price range of the rest of the menu unless everyone agreed to it in advance. When serving yourself, try not to take too much of any one thing. Remember the line of people behind you want to take a little sample of everything too. If food remains after everyone has eaten, it's acceptable to go back for seconds. Ask your host about the leftover policy for the potluck party. Some groups may prefer that each member leaves with their own leftovers while others divvy up the leftovers between the group. It's always nice to offer any leftovers to your host first and then decide how the food will be split amongst the group.